Including seminal conflict management research alongside cutting edge advances in each area of study, this new 4 volume collection will provide a comprehensive portrait of the state of conflict management research. 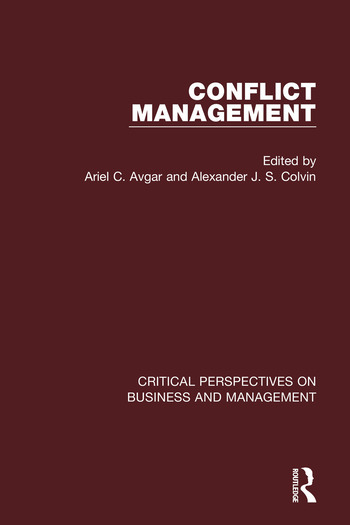 Showcasing the complexities and interdependencies associated with the management of conflict in organizations, the collection will be a valuable contribution to the study of organizational conflict management by advancing the integration of the disciplinary insights, theories, and empirical evidence. L. R. Pondy, ‘Organizational Conflict: Concepts and Models’, Administrative Science Quarterly, 12, 2, 1967, 296-320. S. M. Schmidt and T. A. Kochan, ‘Conflict: Toward Conceptual Clarity’, Administrative Science Quarterly, 17, 3, 1972, 359-370. D. M. Kolb and L. L. Putnam, ‘The Multiple Faces of Conflict in Organizations’, Journal of Organizational Behavior, 13, 3, 1992, 311-324. M. Deutsch, ‘Introduction’, in M. Deutsch (ed. ), The Resolution of Conflict: Constructive and Destructive Processes (Yale University Press, 1977), pp. 3-19. H. C. Katz, T. A. Kochan and M. R. Weber, ‘Assessing the Effects of Industrial Relations Systems and Efforts to Improve the Quality of Working Life on Organizational Effectiveness’,　Academy of Management Journal,　28, 3, 1985, 509-526. C. Ichniowski, ‘The Effects of Grievance Activity on Productivity’, Industrial & Labor Relations Review,　40, 1, 1986, 75-89. J. Cutcher-Gershenfeld, ‘The Impact on Economic Performance of a Transformation in Workplace Relations’,　Industrial & Labor Relations Review, 44, 2, 1991, 241-260. K. A. Jehn, ‘A Multi-Method Examination of the Benefits and Detriments of Intragroup Conflict’, Administrative Science Quarterly, 40, 2, 1995, 256-282. A. C. Amason, ‘Distinguishing the Effects of Functional and Dysfunctional Conflict on Strategic Decision Making: Resolving a Paradox for Top Management Teams’, Academy of Management Journal, 39, 1, 1996, 123-148. K. M. Eisenhardt, J. L. Kahwajy and L. J. Bourgeois III, ‘Conflict and Strategic Choice: How Top Management Teams Disagree’,　California Management Review,　39, 2, 1997, 42-62. T. L. Simons and R. S. Peterson, ‘Task Conflict and Relationship Conflict in Top Management Teams: The Pivotal Role of Intragroup Trust’,　Journal of Applied Psychology,　85, 1, 2000, 102-111. K. A. Jehn and E. A. Mannix, ‘The Dynamic Nature of Conflict: A Longitudinal Study of Intragroup Conflict and Group Performance‘, Academy of Management Journal, 44, 2, 2001, 238-251. C. K. W. De Dreu and L. R. Weingart, ‘Task Versus Relationship Conflict, Team Performance, and Team Member Satisfaction: A Meta-Analysis’, Journal of Applied Psychology, 88, 4, 2003, 741-749. F. R. C. De Wit, L. L. Greer and K. A. Jehn, ‘The Paradox of Introgroup Conflict: A Meta-Analysis’, Journal of Applied Psychology, 97, 2, 2012, 360-390. C. K. W. De Dreu, ‘When Too Much and Too Little Hurts: Evidence for a Curvilinear Relationship between Task Conflict and Innovation in Teams’, Journal of Management, 32, 1, 2006, 83-107. J. D. Shaw, J. Zhu, M. K. Duffy, K. L. Scott, H. A. Shih and E. Susanto, ‘A Contingency Model of Conflict and Team Effectiveness’, Journal of Applied Psychology, 96, 2, 2011, 391-400. K. A. Jehn, S. Rispens and S. M. Thatcher, ‘The Effects of Conflict Asymmetry on Work Group and Individual Outcomes’,　Academy of Management Journal,　53, 3, 2010, 596-616. A. C. Avgar and E. J. Neuman, ‘Seeing Conflict: A Study of Conflict Accuracy in Work Teams’,　Negotiation and Conflict Management Research, 8, 2, 2015, 65-84. K. W. Thomas, ‘Conflict and Conflict Management’, in M. D. Dunnette (ed. ), Handbook of Industrial and Organizational Psychology (Chicago: Rand-McNally, 1976), pp. 889-935. K. W. Thomas, ‘Conflict and Conflict Management: Reflections and Update’,　Journal of Organizational Behavior,　13, 3, 1992, 265-274. B. S. Klaas and A. S. DeNisi, ‘Managerial Reactions to Employee Dissent: The Impact of Grievance Activity on Performance Ratings’,　Academy of Management Journal,　32, 4, 1989, 705-717. M. A. Rahim, ‘A Measure of Styles of Handling Interpersonal Conflict’, Academy of Management Journal,　26, 2, 1983, 368-376. E. van de Vliert and B. Kabanoff, ‘Toward Theory-Based Measures of Conflict Management’, Academy of Management Journal, 33, 1, 1990, 199-209. M. A. Rahim, ‘Toward a Theory of Managing Organizational Conflict’, International Journal of Conflict Management,　13, 3, 2002, 206-235. C. K. W. De Dreu, A. Evers, B. Beersma, E. S. Kluwer and A. Nauta, ‘A Theory-Based Measure of Conflict Management Strategies in the Workplace’, Journal of Organizational Behavior, 22, 6, 2001, 645-668. D. Tjosvold, ‘The Conflict‐Positive Organization: It Depends Upon Us’, Journal of Organizational Behavior,　29, 1, 2008, 19-28. J. B. Olson-Buchanan, ‘Voicing Discontent: What Happens to the Grievance Filer After the Grievance?’,　Journal of Applied Psychology,　81, 1, 1996, 52-63. K. E. Boroff and D. Lewin, ‘Loyalty, Voice, and Intent to Exit a Union Firm: A Conceptual and Empirical Analysis’,　Industrial & Labor Relations Review, 51, 1, 1997, 50-63. J. B. Olson-Buchanan and W. R. Boswell, ‘An Integrative Model of Experiencing and Responding to Mistreatment at Work’, Academy of Management Review, 33, 1, 2008, 76-96. S. Alper, D. Tjosvold and K. S. Law, ‘Conflict Management, Efficacy, and Performance in Organizational Teams’,　Personnel Psychology,　53, 3, 2000, 625-642. R. A. Friedman, S. T. Tidd, S. C. Currall and J. C. Tsai, ‘What Goes Around Comes Around: The Impact of Personal Conflict Style on Work Conflict and Stress’,　International Journal of Conflict Management,　11, 1, 2000, 32-55. L. A. DeChurch and M. A. Marks, ‘Maximizing the Benefits of Task Conflict: The Role of Conflict Management’,　International Journal of Conflict Management,　12, 1, 2001, 4-22. M. M. Montoya-Weiss, A. P. Massey and M. Song, ‘Getting it Together: Temporal Coordination and Conflict Management in Global Virtual Teams’, Academy of Management Journal,　44, 6, 2001, 1251-1262. M. A. von Glinow, D. L. Shapiro and J. M. Brett, ‘Can We Talk, and Should We? Managing Emotional Conflict in Multicultural Teams’, Academy of Management Review, 29, 4, 2004, 578-592. K. J. Behfar, R. S. Peterson, E. A. Mannix and W. M. Trochim, ‘The Critical Role of Conflict Resolution in Teams: A Close Look at the Links between Conflict Type, Conflict Management Strategies, and Team Outcomes’,　Journal of Applied Psychology,　93, 1, 2008, 170-188. A. G. Tekleab, N. R. Quigley and P. E. Tesluk, ‘A Longitudinal Study of Team Conflict, Conflict Management, Cohesion, and Team Effectiveness’,　Group & Organization Management,　34, 2, 2009, 170-205. J. M. Brett and S. B. Goldberg, ‘Grievance Mediation in the Coal Industry: A Field Experiment’,　Industrial & Labor Relations Review,　37, 1, 1983, 49-69. R. Freeman and J. L. Medoff, ‘The Exit-Voice Trade Off’, in R. Freeman and J. L. Medoff (eds), What do Unions do? (Basic Books, 1984), pp. 94-110. D. I. Rees, ‘Grievance Procedure Strength and Teacher Quits’,　Industrial & Labor Relations Review,　45, 1, 1991, 31-43. B. Bemmels and J. R. Foley, ‘Grievance Procedure Research: A Review and Theoretical Recommendations’,　Journal of Management,　22, 3, 1996, 359-384. D. Lewin and R. B. Peterson, ‘Introduction’, in D. Lewin and R. B. Peterson (eds), The Modern Grievance Procedure in the United States (Greenwood Press, 1988), pp. 1-19. W. L. Ury, J. M. Brett and S. B. Goldberg, ‘Three Approaches to Resolving Disputes: Interests, Rights, and Power’, in W. L. Ury, J. M. Brett and S. B. Goldberg (eds), Getting Disputes Resolved: Designing Systems to Cut the Costs of Conflict (Jossey-Bass, 1988), pp. 3-19. W. L. Ury, J. M. Brett and S. B. Goldberg, ‘Designing an Effective Dispute Resolution System’, in W. L. Ury, J. M. Brett and S. B. Goldberg (eds), Disputes Resolved: Designing Systems to Cut the Costs of Conflict (Jossey-Bass, 1988), pp. 20-40. C. A. Constantino and C. S. Merchant, ‘Recognizing Conflict Management as a System’, in C. A. Constantino and C. S. Merchant (eds), Designing Conflict Management Systems (Jossey-Bass, 1996), pp. 19-32. C. A. Constantino and C. S. Merchant, ‘Managing Conflict Effectively: Alternative Dispute Resolution and Dispute Systems Design’, in C. A. Constantino and C. S. Merchant (eds), Designing Conflict Management Systems (Jossey-Bass, 1996), pp. 33-48. D. B. Lipsky, R. Seeber and R. D. Fincher, ‘Introduction: The Emergence of Conflict Management’, in D. B. Lipsky, R. Seeber and R. D. Fincher (eds), Emerging Systems for Managing Workplace Conflict (Jossey-Bass, 2003), pp. 3-28. A. J. Colvin, B. Klaas and D. Mahony, ‘Research on Alternative Dispute Resolution Procedures’, in D. Lewin (ed. ), Contemporary Issues in Employment Relations, (ILR Press, 2006), pp. 103-147. C. Bendersky, ‘Organizational Dispute Resolution Systems: A Complementarities Model’, Academy of Management Review, 28, 4, 2003, 643-656. A. J. Colvin, ‘The Dual Transformation of Workplace Dispute Resolution’, Industrial Relations: A Journal of Economy and Society,　42, 4, 2003, 712-735. A. J. Colvin, ‘Institutional Pressures, Human Resource Strategies, and the Rise of Nonunion Dispute Resolution Procedures’,　Industrial & Labor Relations Review,　56, 3, 2003, 375-392. C. Bendersky, ‘Complementarities in Organizational Dispute Resolution Systems: How System Characteristics Affect Individuals' Conflict Experiences’, Industrial & Labor Relations Review 60, 2, 2007, 204-224. M. Rowe, ‘An Organizational Ombuds Office in a System for Dealing with Conflict and Learning from Conflict, or "Conflict Management System"’, Harvard Negotiation and Law Review,　14, 2009, 279. W. Roche and P. Teague, ‘Do Conflict Management Systems Matter?’, Human Resource Management,　51, 2, 2012, 231-258. A. C. Avgar, J. R. Lamare, D. B. Lipsky and A. Gupta, ‘Unions and ADR: The Relationship between Labor Unions and Workplace Dispute Resolution in US Corporations’,　Ohio State Journal on Dispute Resolution,　28, 2013, 63-106. O. M. Fiss, ‘Against Settlement’, Yale Law Journal,　93, 1983, 1073-1093. H. T. Edwards, ‘Alternative Dispute Resolution: Panacea or Anathema?’, Harvard Law Review, 1986, 668-684. L. B. Edelman, ‘Legal Environments and Organizational Governance: The Expansion of Due Process in the Workplace’, American Journal of Sociology, 95, 1990 1401–1440. C. Menkel-Meadow, ‘Pursuing Settlement in an Adversary Culture: A Tale of Innovation Co-opted or "the Law of ADR"’,　Florida State University Law Review,　19, 1991, 1-46. J. R. Sutton, F. Dobbin, J. W. Meyer and W. R. Scott, ‘The Legalization of the Workplace’,　American Journal of Sociology, 4, 1994, 944-971. P. Feuille and D. R. Chachere, ‘Looking Fair or Being Fair: Remedial Voice Procedures in Nonunion Workplaces’, Journal of Management, 21, 1, 1995, 27-42. K. V. W Stone, ‘Mandatory Arbitration of Individual Employment Rights: The Yellow Dog Contract of the 1990s’, Denver University Law Review, 73, 1996, 1017-1050. L. B. Bingham, ‘Employment Arbitration: The Repeat Player Effect’,　Employee Rights and Employment Policy Journal,　1, 1997, 189-220. T. Eisenberg and E. Hill, ‘Arbitration and Litigation of Employment Claims: An Empirical Comparison’, Public Law and Legal Theory Research Paper Series (New York University), 2003, 1-25. D. S. Sherwyn, S. Estreicher and M. Heiss, ‘Assessing the Case for Employment Arbitration: A New Path for Empirical Research’, Stanford Law Review, 57, 5, 2005, 1557-1591. S. Estreicher, ‘Saturns for Rickshaws: The Stakes in the Debate Over Predispute Employment Arbitration Agreements’, Ohio State Journal on Dispute Resolution, 16, 3, 2001, 559-570. L. B. Bingham, C. J. Hallberlin, D. A. Walker and W.-T. Chung, ‘Dispute system design and justice in employment dispute resolution: Mediation at the workplace. Harvard Negotiation Law Review,　14, 1, 2009, 1-50. A. J. Colvin, ‘An Empirical Study of Employment Arbitration: Case Outcomes and Processes’,　Journal of Empirical Legal Studies,　8, 1, 2011, 1-23. A. J. Colvin and K. Pike, ‘Saturns and Richshaws Revisited: What Kind of Employment Arbitration System has Developed?’,　Ohio State Journal on Dispute Resolution, 29, 2014, 59-83. Z. J. Eigen and A. S. Litwin, ‘Justice or Just between Us? Empirical Evidence of the Trade-Off between Procedural and Interactional Justice in Workplace Dispute Resolution’,　Industrial & Labor Relations Review,　67, 1, 2014, 171-201.